Summer 2018 is almost finished. In a few days the roses will have vanished from my garden. 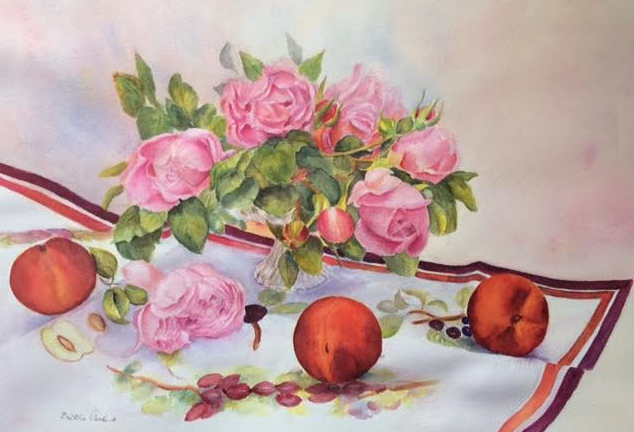 I quickly put together a bouquet and nectarines in the same style I had already painted an acrylic. Fine art artist paint Winsor Newton. ​For the green leaves, I will post later how I achieve my greens. I work very slowly to achieve the details. 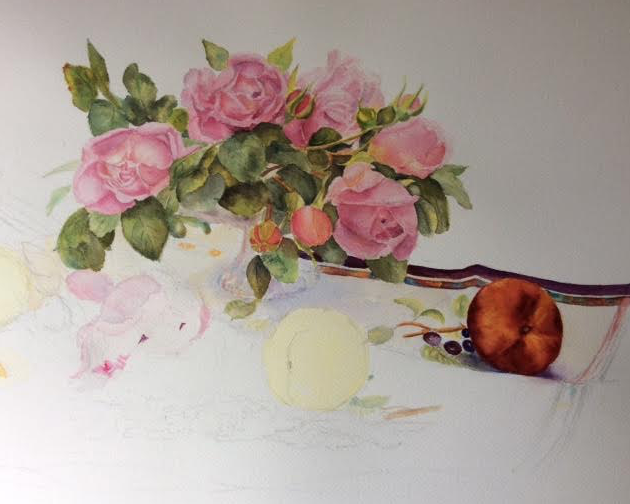 On this session I have finished the first rose and have started on the second bud. I can reveal for the greens, I always start laying Winsor Yellow with a added touch of Cerulean. I mix the paint on the paper, not on the palette. It is incredible how a couple of hours here and there can do!!! As you see, the bouquet is almost finished, BUT..... I must admit I was not too happy with the pinks. I wanted some reinforcements within the colours. I visited Artwrite in my town. There I could find the paint Daniel Smith. Excellent as there is a hand painted chart showing what it looks like! And so I added Opera Pink and Quinacridone Pink. At this stage, I started to suffer. All my carefully drawn composition was vanishing. I always work over paper towel, protecting my work but somehow the pencil marks had gone. I had to redraw the missing parts. I will have to try to find out, if there is a way to fix the drawing and again with the possibility to erase it when the painting is finished. 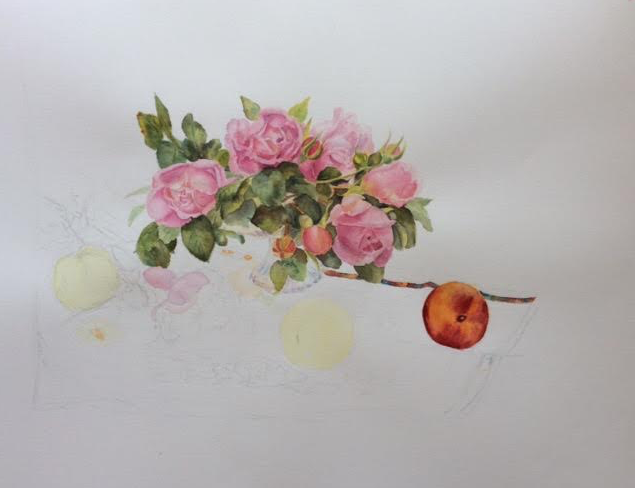 However I have added the peaches (nectarines) with as much as 5 layers of paint. Winsor Yellow+ Scarlet Red- The following layers were reinforced with Alizarin and on the darkest parts Alizarin+Ultramarine. So, here we are! The finished product! "Goodbye Summer 2018"
I always lay the background after I have finished the painting. It is totally mad as I can destroy all my work but it is my way of painting. 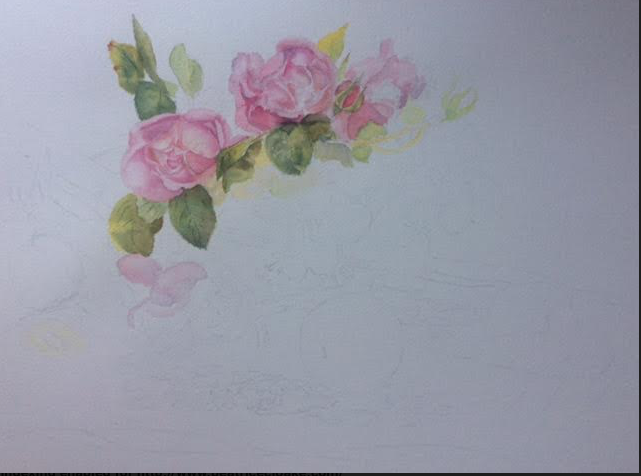 I carefully lay masking fluid on all the edges, this time, the bouquet and the edges of the table cloth. I wet the paper and let all the colours I have used for the roses fuse into one another. Finally before it was dry, I added some Cobalt blue. Now, I am just contemplating what I am going to do with this painting!